Dongfang Electric Corporation (东方电气) is primarily focused on the manufacture and distribution of Energy generation via different mediums, but mainly thermal, nuclear and wind energy. Their man products consist of turbines, thermal power generation equipment, power generation equipment etc. It has a revenue of 30.2 Billion Chinese Yuan as of 2017. 3. Capability in the Coal, Wind, Nuclear. 1. Strong International Presence: Dongfang Electric has a very strong international presence worldwide. They have undertaken and completed multiple projects across the globe; this represents the reach of China and the reach of Dongfang Electric. They have taken projects in most of Asia including India, Pakistan, and south Asian countries, they have also undertaken projects in Ethiopia and Brazil. Their major markets are present in the Asian region including China. Dongfang electric have a lot of contracts with the Asian countries. The organisation is dealing with multiple projects in India itself, In Indonesia; Dongfang electric is handling their largest hydroelectric projects, similarly is the case with Pakistan, Malaysia and other Asian countries. For example, In India, Dongfang Electric has taken multiple projects in Rajasthan, e.g. project for Rajasthan West Power Ltd., two projects for BGR Energy System; also they have projects in Chhattisgarh for Lanco Amarkantak Plant, along with plants in West Bengal for West Bengal power development. 2. Strong Government Influence: Dongfang Electric is a publicly traded government backed organisation,they are a government owned entity which means that they are under direct administration of Chinese Central government and are closely linked with the policies. All the nuclear power generation in China is undertaken by Dongfang Electric which gives them a very rich platform to work on. Being a government entity, they have ample opportunities to research and come up with the direction towards better turbine and generators technologies. 3. Capabilities in Coal, Wind and Nuclear: Dongfang Electric have established and proved their expertise through various projects in China and all over Asia, they have proved their nuclear expertise in China, Coal expertise in India and Wind energy generation capacity in Ethiopia. With all these successful project it gets easier for them to build their credibility and pitch to newer clients and countries which are looking for meeting their energy needs. 4. Strong Research and Development Team: Dongfang has a very strong Research and Development team at their helm. Dongfang was honoured by the Chinese government in the first batch of their “Innovation Oriented Enterprises”. Dongfang Electric R&D department was established in the year 1994 and since then it has been contributing to the machineries developed by Dongfang Electric. Dongfang Electric has the capacity to plan and build electric power systems, geotechnical surveys, explorations, and different types of fossil fuelled power plants. 1. Threats from competitors: Dongfang Electricals’ declining brand power and other competitors like HPEC, BHEL, Toshiba hydro power company, HABIN, Schneider, and ABB are increasing pressure on the Dongfang Electricals’ market and their operations. Dongfang thermal unit has the largest market share among the listed companies, but for rising Indian companies like BHEL, and established giant like ABB, Dongfang experiences real threat of keeping up with the pace or perish. 2. Budgets assigned to the company in the federal budget of China: As Dongfang is a government owned entity, there is a certain budget requirement that it has to adhere to, and that becomes one of its weak links. Gross profit of Dongfang has been decreasing year on year, it was 20.6 million in USD, which has been reduced to 14.9 in 2017, which shows that they are making lesser profit, on the other hand the tax, that Dongfang has paying to the republic of china has been increasing over the years, i.e. 38.6 million USD in 2014 to 56.9 million USD in 2016. 1. Favouring Tax Policies: Dongfang Electric being a publicly traded organisation gives a unique position to Dongfang electric, as it gains a substantial amount by the government’s taxing policies, even if Dongfang makes it as an exception or other loopholes for the taxation laws and regulation. 2. Political Security in China: Political security in China is unparalleled as they have a communist government with the utmost strength. Dongfang with its strong backing and political influences also gains some contracts, being the superpower in the Asian region; China can sure twist some arms for Dongfang electric. 1. High Growth rate: The business and the industry, Dongfang electric operates in, the entire industry in experiencing tremendous growth and will look for further expansion in future. China has been the one of the most emerging economies in Asia and in the world. So in such economic scenarios, Dongfang can expand its business and expect to succeed in the current market scenario. China’s GDP has been growing at an average rate of 7.2. China has a trade surplus over the last ten years which accounts for its trade balance of around 260 billion USD since 2013. 2. Economic Stability: China GDP growth rate was 6.9% in the second quarter of 2017, according to government data released last Monday, the above position is above where China had anticipated itself to be in the end of the second quarter, hence things are looking good for China currently and with a stable political helm, this does not look to go away anytime soon. Hence in a stable economic environment, Dongfang Electric can grow and expand. 1. Failure Cases and Penalties: Dongfang electric has a record of failures and hence had to pay penalties for the efforts wasted, more than that the reliability of the company has gone down in a big way, Dongfang electric have also been black listed in some countries for doing their businesses unethically and using undue favours from the Chinese government, with this scenario growing and the world moving towards a global village, this could prove fatal for the operations of Dongfang electric. For example, the case with ITAT Kolkata, India proved to be a dampener for Dongfang electric, as was the failure case in Amarkantak that led to penalties and rework for the company. 2. Changing Policies: Ambiguous policies lead to many interpretations of the law and can result in loss of brand, reputation, money and more. For example, in Sweden, a dispute had raised over the boiler technologies that Dongfang was using in a project. 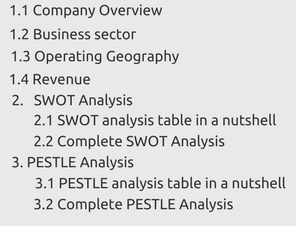 This was dragged to court by Foster Wheeler. The government passed an addendum, helping Dongfang’s cause and reducing the damages and liabilities to just US$ 15 million which was earlier expected to be around US$ 53 million. Also the policies by which internal disputes are handled within the company are many s times ambiguous and misleading which can be an easy recipe for disputes. 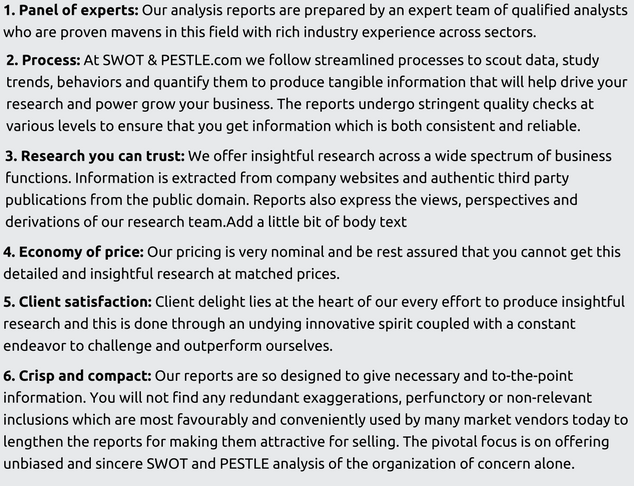 Dongfang Electric SWOT and PESTLE analysis has been conducted by Saurabh Chandra and reviewed by senior analysts from Barakaat Consulting. 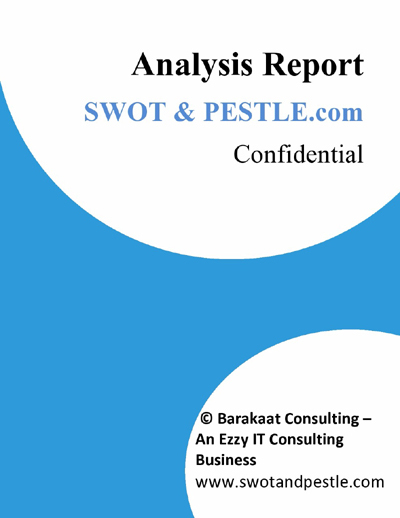 Copyright of Dongfang Electric SWOT and PESTLE Analysis is the property of Barakaat Consulting. Please refer to the Terms and Conditions and Disclaimer for usage guidelines.